On this project silica fume was added primarily to enhance constructability. The concrete walls in this structure are 4.5 ft (1.4 m) thick. To prevent thermally induced cracking, the designer specified very tight control over the maximum temperature rise allowed in the concrete. 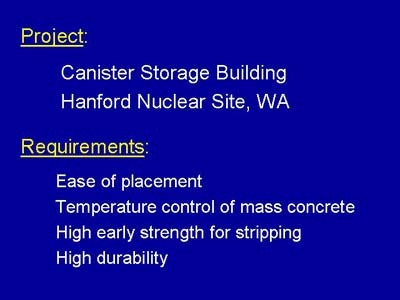 To meet the requirements for concrete temperature, the contractor elected to use a Class F fly ash in the concrete. While the fly ash did help to reduce temperature development, the early strength gain characteristics of the concrete were such that form removal was delayed. Addition of silica fume to the concrete provided additional early strength to facilitate form removal on a satisfactory schedule. Holland, T. C., "High-Performance Concrete: As High as It Gets! ", The Concrete Producer, V. 16, No. 7, July, 1998, pp. 501-505.